Memberships – Queensland Wildlife Artists Society Inc. 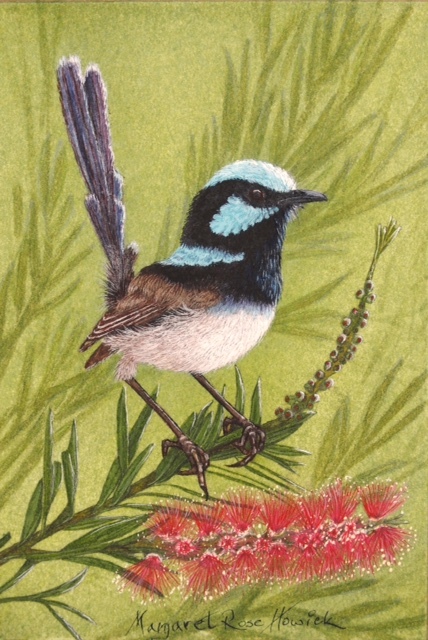 The Queensland Wildlife Artists Society Incorporated was established in 1983, in Brisbane Australia, by a small group of artists interested in fostering the study and appreciation of wildlife art specifically relating to Australia's unique flora and fauna. Since then membership has steadily grown to include artists from all over Australia as well as overseas. To engage the general public and to educate them through art, on the importance of preserving Australia's unique natural heritage, and the imperativeness of environmental sustainability. To organize and publicise environmentally themed art exhibitions with a large number themed to Australian species. To assist young and emerging artists to achieve their potential with access to workshops, demonstrations and mentoring by leading master artists. To use exhibitions to increase awareness of species and habitats covering a wide spectrum of flora and fauna that are threatened, from around the world. To generate career support and professional development opportunities for artist members. To facilitate art sales and commissions to support conservation and artists. We are constantly on the lookout for new members whose talents would mesh well with the society. If you are a highly skilled artist who is passionate about depicting nature in their art, or are a newly emerging artist interested in fostering this interest in subject matter with the help of more experienced mentors, you may consider applying for selection to this not for profit organization. As a group we work together to promote our work, participate in member's only exhibitions and at the same time promoting our conservational and environmental message through art. While we are a not for profit incorporation staffed by volunteers, we do have many expenses that are shared among the members (please see membership pricing at the bottom of this page). You will be contributing to the QWASI mission of Education through Art. You will feel the prestige of being accepted into one of Australia's leading wildlife Art Societies. You will be eligible to enter QWASI exhibitions which are open to members only (unless otherwise agreed upon with conservation groups or art societies). There may be up to three major shows in a year. You will have full representation on the official QWASI website which is updated regularly. Once selected you will be asked to provide all the relevant materials for your page which is linked to your personal website. You will receive the QWASI newsletter which comes out every two months in full colour. It contains up and coming open exhibitions, member's art news, world art news, coming events and much more. You will have the opportunity to post exhibitions, news and events on the website and in the newsletter. Thank you for your interest in joining The Queensland Wildlife Artists Society Inc. We have three different membership categories. Please indicate on the membership application form which category you would like to apply for. We ask for all new members to please read through the QWASI Model Rules and By-Laws as details on our website. These documents outlines the objectives of QWASI, how we conduct our exhibitions, copyright guidelines, photographic reference used and other aspects of QWASI. Please sign the membership application form where indicated to confirm that yo have read through these documents and agree to abide by them when joining QWASI. When applying for membership please consider a short bio of your art history and any interest relating to flora dn fauna of Australia. Exhibitions you may have attended, Flora dn Fauna conservation you may have connections with and your general interest in Australian Wildlife. If you know a current member you may like to ask him or her to support your application with an email. While membership normally continues as long as dues are paid, QWASI reserves the right to subject any financial member to a review process if it is felt their standard of work has dropped or their interests clash with the objectives of the Society. QWASI reserves the right to revoke membership of members whose work is deemed no longer up to standard. The QWASI financial year starts January 1st with a small discount to membership after 1st July. For people interested in wildlife art who are not currently artists or not exhibiting at this time, but they are interested in attending meetings, workshops and outings. As places in workshops may be limited, preference will be given to our members over non-members. For wildlife artists under 18 years of age. Come and join us at a Outing / General meeting, held every second Sunday of the month. Venue and time advised on the website and social media pages. Please bring a completed application form and current work. If your work is already posted on the internet, send the web address or email images with size and medium details to info@qldwildlifeartists.com.au. You must also complete an application form. A one-time Joining Fee of AUD $20.00 applies to Ordinary memberships. APPLY ONLINE or download a PDF Application Form.